Daniel Ketchum, Sr. Franchise Art Director for Magic: The Gathering, spent more than a decade editing comics before finding his way to the Multiverse. Hello! I'm Daniel Ketchum, one of the art directors on the Magic Franchise team. I am so excited to share with you a quick behind-the-scenes peek at the work the Franchise team has been doing, as well as preview a couple exciting cards from War of the Spark! The Franchise team hasn't been around for long, but the scope of our work is pretty expansive: we are tasked with developing new and exciting expressions of Magic for you to enjoy. Magic: The Gathering just celebrated its 25th year and during its lifetime has dabbled in mediums other than playing cards, such as comics and novels. The Franchise team is on a mission to revitalize those efforts, as well as kickstart a few new ones. To lay the groundwork for these new entertainment expressions, we are systematically delving into our characters and adding the depth and dimension to them that they'll need in order to function in those spaces. For example, from card illustrations, we know what our many Planeswalkers look like from the front, heroically posed, their eyes and fists glowing with magic. But what do they look like from behind? How do they move across a battlefield, and how do they fight when engaged in combat? What sorts of things do they say to their opponent? What are they fighting for in the first place? It's a fun and challenging task getting to know these characters as living, breathing beings, identifying what's already been established and creating material to fill in the gaps. For example, let's take Chandra Nalaar. We are lucky to have scads of artwork depicting Chandra in all sorts of contexts, be it a moment of tenderness, as depicted in Cathartic Reunion, or a moment of outrage, as depicted in Chandra's Outburst. But there's one piece of artwork I often use as reference for artists depicting Chandra rushing into battle and slinging fire at her enemies, and that's Kieran Yanner's beautiful painting for Chandra's Pyrohelix. 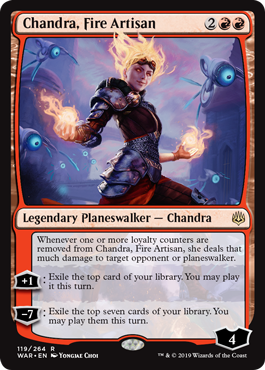 Not only does it depict Chandra's fiery personality, but it tells us so much in a single image: how she moves, what it looks like when she casts a spell, and how that magic might manifest. It's a great piece of art that shows so much about the character. And I'm happy to say that we'll be seeing Chandra's Pyrohelix once more in War of the Spark, with new artwork by Aleksi Briclot that further draws out our favorite pyromancer! Using art such as this and the foundation-building work we've been doing on the characters, the Franchise team arms up our partners with the information they'll need to tell stories in a variety of mediums. For Principal Franchise Designer Nic Kelman, that takes the form of working with authors such as Martha Wells, Kate Elliott, Nicky Drayden, and Cassandra Khaw on new Magic web fiction efforts, as well as novellas (check out Brandon Sanderson's Children of the Nameless!) and novels (Django Wexler's War of the Spark prequel novel and Greg Weisman's Ravnica will be available later this month from Del Rey!). Myself, I've been working with the editorial team over at IDW Publishing to bring Magic back to comics. Working with external partners to continue building upon our characters and worlds is a balancing act for sure, but we've been very lucky to collaborate with talented creators who respect existing continuity while finding new angles and story hooks that will move Magic forward. I was thrilled when writer Vita Ayala signed on to pen the Chandra comic, because they're both a fan of Magic and a veteran comics scribe, so I knew they'd be adept at finding the right line to walk. But I was curious to know what Vita's experience has been like working on the comic, so I shot them an e-mail with a few questions. DANIEL KETCHUM: Vita, how is writing story for Magic: The Gathering different from writing for other established properties? VITA AYALA: When I work on other licensed work, even if there are other aspects of the properties, usually the comics are considered a completely separate realm. But with Magic, while I am operating in the sphere of comics, the game has to be kept in mind. The game, prose, and other parts are all interconnected, and the stories take place in the same shared space as far as story goes. But, not always in the ways that might be expected (not always in a "This is in the game so it has to be worked in" sort of way)! Sometimes, it is about remembering particulars if I want to reference something, but sometimes it is remembering that the game is just that, and that what works in-game may not work in comics as a medium. So my editors and I solve the puzzle of how to represent things that exist in the game in ways that make sense in comics. It is a lot of fun! DK: What do you think are the most compelling aspects of Chandra's character? VA: Chandra has an incredible capacity for kindness and loyalty, and I particularly enjoy how it is filtered through her fiery (sorry, I can't help the puns) personality. She is never boring! I have always loved how dynamic and explosive she is. There is no guile to this woman—she wears her heart on her sleeve, and it is ablaze! DK: Needless to say, Magic: The Gathering—Chandra features Chandra, but it also spotlights her relationships with fellow Planeswalker Ajani Goldmane and her mother, Pia. What made you decide to feature those particular characters? VA: Part of it was the need to give her a way to express her internal conflict in a way that wasn't just punching/setting things on fire. 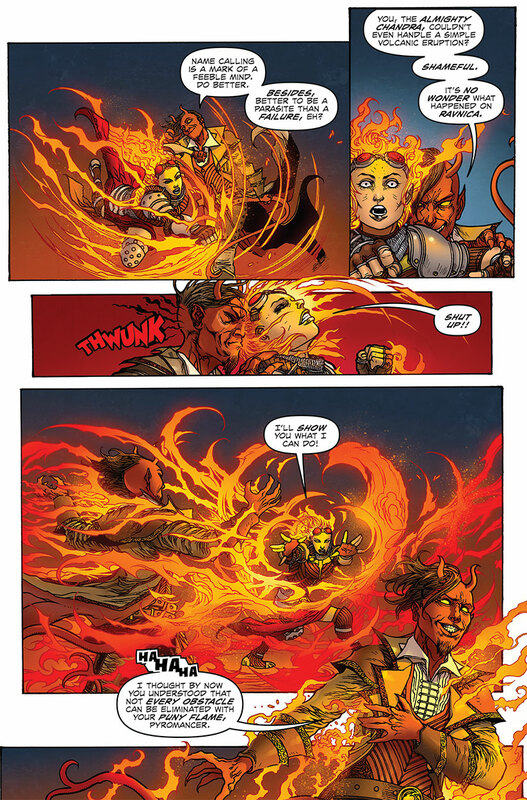 Chandra is an action-oriented character, and if we let her, she will deal with all her problems with her fists and flames. But we knew that would not really get her to a place where she could process things, just put them off. So we incorporated that into the story, and then went a step further and brought in emotional foils for her. Pia, to me, was clearly going to be necessary. Their relationship is still a little uneasy, but they have a lot of love and respect for each other. If this series was going to feature Chandra dealing with her demons at all, her mother (and past) would have to play a role. And I think that Pia is someone who can understand the turmoil that Chandra is going through on a deep level—Pia is a revolutionary. She's fought, she's loved and lost. She knows. And it was actually Wizards that first brought up Ajani specifically! Early in development, I was told I could bring in a Planeswalker ally to have Chandra play off of. My first inclination was actually Liliana, but as we were talking, we came to the conclusion that we didn't need her ally to challenge/antagonize her into dealing with her issues. As much as I love Liliana (and I do), that would be more her style. But that's what the villain is for! We needed someone who could give Chandra the space and support to heal. You (Daniel) suggested going on the lighter side of the color wheel, and Ajani immediately made sense. He is a mentor to heroes, right, and literally his thing is support and life. Perfect fit! DK: This is the first time Chandra is headlining her own serialized fiction. What opportunities did this present that you were most excited to explore in this series? 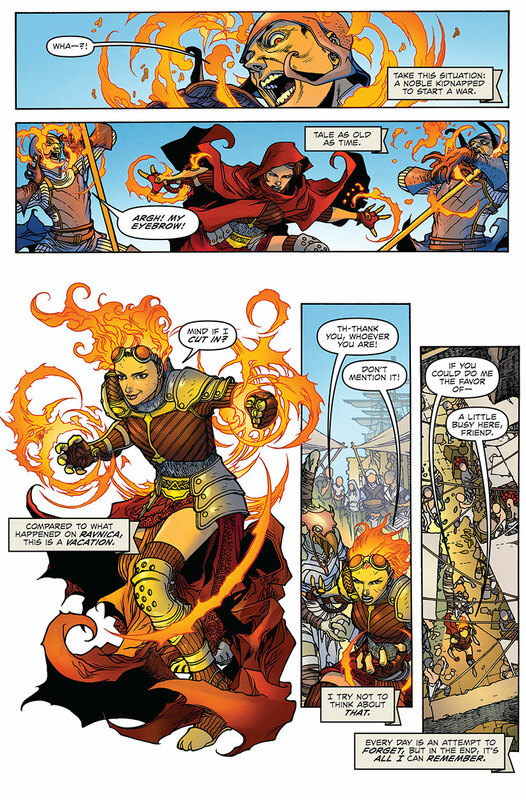 VA: Comics is primarily a visual medium, and Chandra is a very visually interesting character (comes with the whole pyromancer territory). I am so happy at the chance to collaborate on a project that gets to really highlight and celebrate just how intense and brilliant Chandra is when she in is her element. It was also an honor getting to explore her journey of dealing with the fallout of some of the truly grueling and tragic experiences in the recent and semi-recent past. She's been through a lot in the last few years, and being able to be part of a project that both deals with her internal struggle and the external manifestations in such a dynamic way is really special. If you're interested in checking out the tremendous work Vita is doing on the comic, the second issue of Magic: The Gathering—Chandra is available online and in stores now. And we have more exciting projects in the pipeline that will offer up new opportunities to see our characters in story! Of course, I'd be remiss if I neglected to recognize what's probably brought you here in the first place: War of the Spark, Magic's first expansion set in the modern era that doesn't focus on a location or plane, but rather, a major story event. And just as we've seen innovations for Chandra in her comic, we'll be seeing some new things for her in War of the Spark as well. So, without further ado, I'm excited to present you with Chandra, Fire Artisan, painted by the magnificent Yongjae Choi! 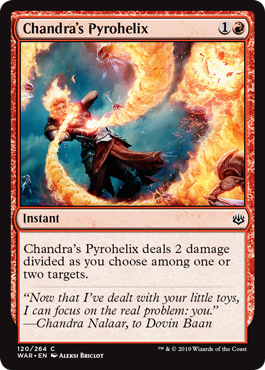 Your first chance to fight alongside Chandra, Fire Artisan will be at the War of the Spark Prerelease April 27–28. And stay tuned for some big announcements from the Franchise team later this year for more ways you'll be able to enjoy Magic story in the future!